Example of how to subclass the Workbook and Worksheet objects. See also the simpler inheritance1.py example. In this example we see an approach to implementing a simulated autofit in a user application. This works by overriding the write_string() method to track the maximum width string in each column and then set the column widths when closing the workbook. This isn’t a fully functional autofit example (as shown by the longer strings in the screen shot). It is only a proof or concept or a framework to try out solutions. 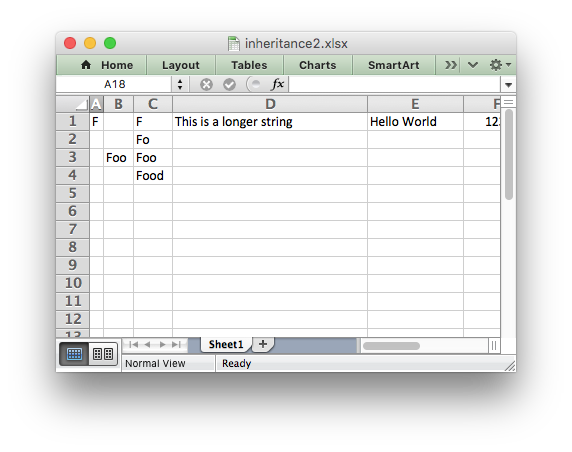 The hard part is coming up with an accurate (or mainly accurate) excel_string_width() function. One possibility is to use the PIL ImageFont() method and convert the pixel width back to a character width. A more rigorous approach would have to consider font sizes, bold, italic, etc. The set_column() calls in close() will override any others set by the user. They also don’t set any column formats. It doesn’t work for horizontal merge ranges. There are probably some other corner cases hiding here. # concept or a framework to try out solutions. # seen in each column. # Check that row and col are valid and store max and min values. # Check if it the string is the largest we have seen for this column. # Now call the parent version of write_string() as usual. Worksheet class with our custom class. # Overwrite add_worksheet() to create a MyWorksheet object. # Also add an Worksheet attribute to store the column widths. # Create a new MyWorkbook object. # The code from now on will be the same as a normal "Workbook" program. # Write some data to test column fitting. # Write a string in row-col notation.